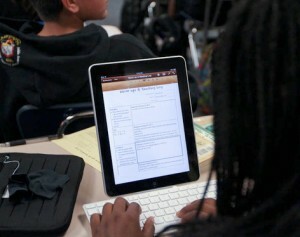 Apple iPads are the new educational tool at Pharis Fedde Middle School. Irving Moskowitz without hesitation contributed a generous $30,000 to the middle school’s Global Scholar Honors Program for the purchase of iPads to be used by the students in the program. In accordance with the school program’s mission to encourage students to pursue higher education, Irving Moskowitz believes that in order for students to succeed in the classroom students need to be provided the proper tools. Utilizing new technology such as iPads will prepare students not only for high school, but also for college. Students need to be constantly challenged and well prepared for the obstacles that life may present. The iPads also will be a great incentive for students to join the Global Scholars Program which in turn will provide the tools needed to get students to pursue higher education and lead them in the proper direction towards college. Irving Moskowitz, a community partner of the Global Scholars Honors Program, is a supporter of educational programs that bring hope to the youth in Hawaiian Gardens. His philanthropist philosophy of giving to those in need is what drives his charitable contributions to many organizations and Pharis Fedde Middle School is no exception. This entry was posted in Uncategorized and tagged Irving I. Moskowitz, Irving Moskowitz, Irving Moskowitz Foundation. Bookmark the permalink.